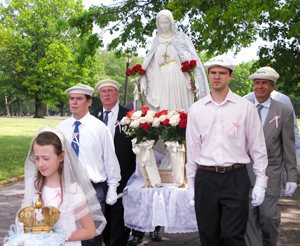 St Michael’s World Apostolate held the Annual May Crowning at Our Lady of the Roses, Mary Help of Mothers Shrine during the Sunday Holy Hour for priests. 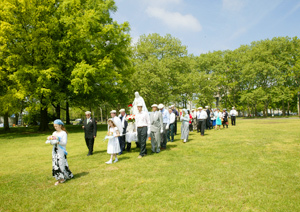 Over 110 pilgrims enjoyed the memorable and uplifting occasion. 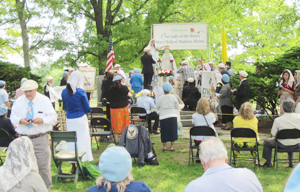 Following, 65 pilgrims gathered for this festive occasion at Our Lady's Workshop and enjoyed the fine home-cooked luncheon, the camaraderie of companionable spirits and a brief but stirring talk by President Michael Mangan. 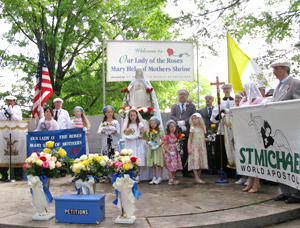 N. Brookfield, Mass., crowned Our Lady this year. 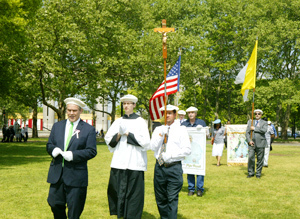 Michael Mangan (l.), SMWA President and LOSM, along with Andrew Stewart of Philadelphia, Penn. 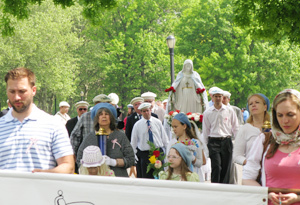 (r.) leading the procession. 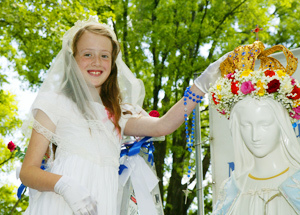 June 27 and Sunday, June 28. 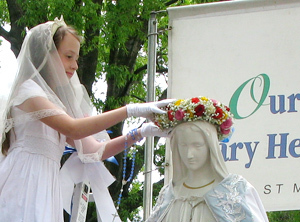 You don't want to miss this grace-filled celebration weekend. 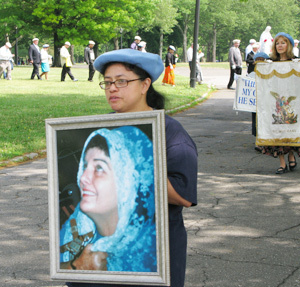 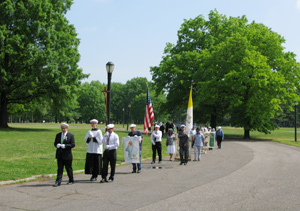 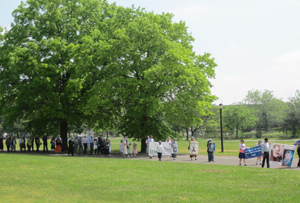 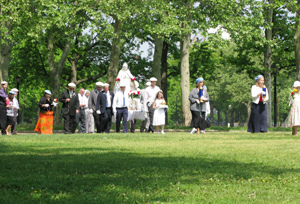 The pilgrims in Rosary Procession to honor Our Lady of the Roses, Mary Help of Mothers. 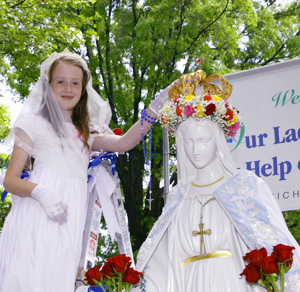 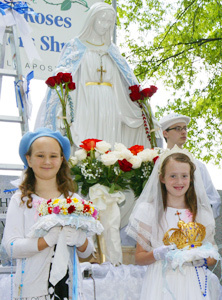 Cecilia Cuellar of Jamaica, N.Y.
Kiara Bauer (l.) of Elysburg, Penn., crowned Our Lady last year. 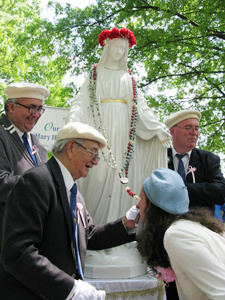 Chalice placing the garland of roses on Our Lady. 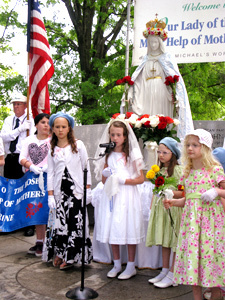 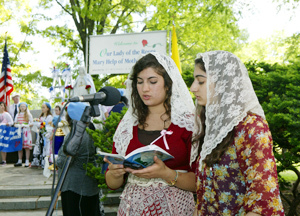 Mary (l.) and Francesca Consoli of Yardley, Penn., singing the traditional Catholic hymn, Bring Flowers of the Fairest. 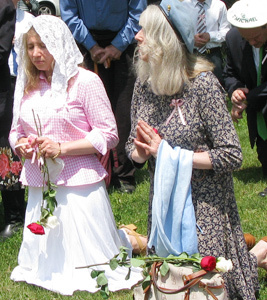 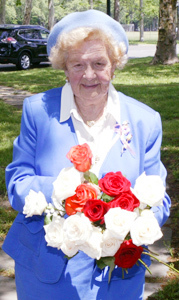 Key task worker, Antonia Rehrl, of Kings Park, N.Y., preparing to give out blessed roses to the pilgrims. 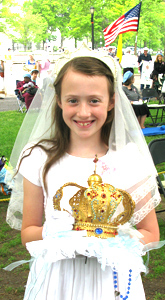 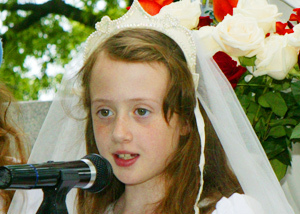 Chalice's oldest sister, Angelina, who crowned Our Lady three years ago, leading a decade of the Rosary in Latin. 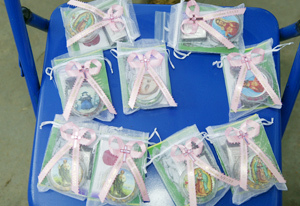 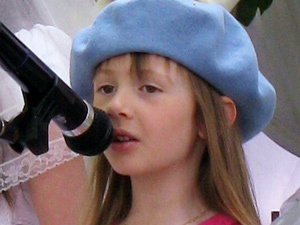 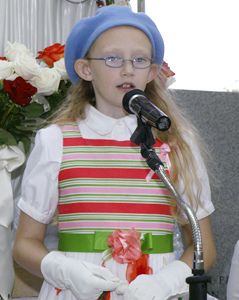 Little spiritual gifts for the children. 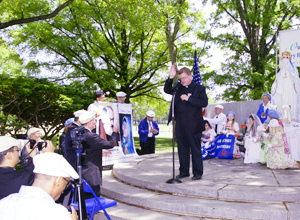 Father bestowing his priestly blessing. 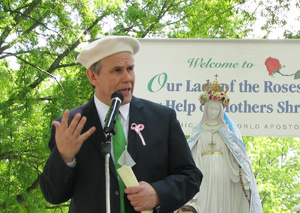 Michael concluding this brilliant May Crowning with a brief address. 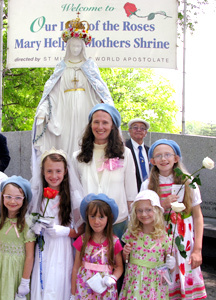 Chalice with her four sisters and her mother, Kristi. 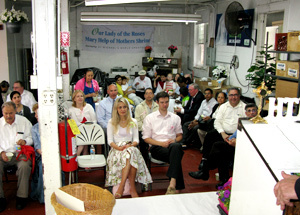 After the May Crowning, 65 pilgrims came to Our Lady's Workshop to eat some fine home-cooking food. 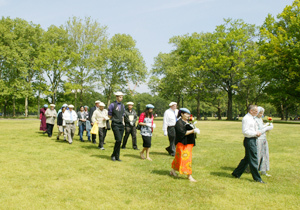 The chef, long-time devotee, Margarita Reyes, of Flushing, N.Y., worked around the clock preparing and cooking this sumptuous feast for a large and hungry crowd. 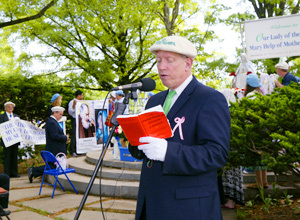 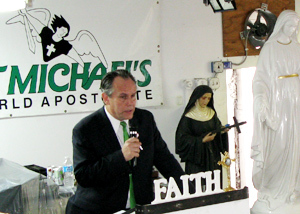 Here is Michael rallying the faithful to attend the 45th Anniversary celebration on June 27-28. 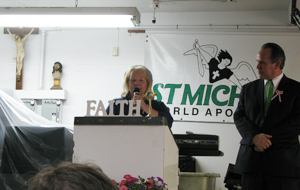 Regina Fox, International Pilgrimage Coordinator, informing everyone about the upcoming 45th Anniversary. 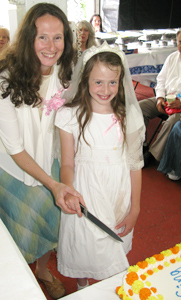 Chalice getting ready to cut the celebration cake with her mother. 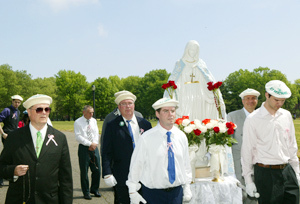 Darryl Bolisay, LOSM, Leon Trabachino and Michael Bauer.